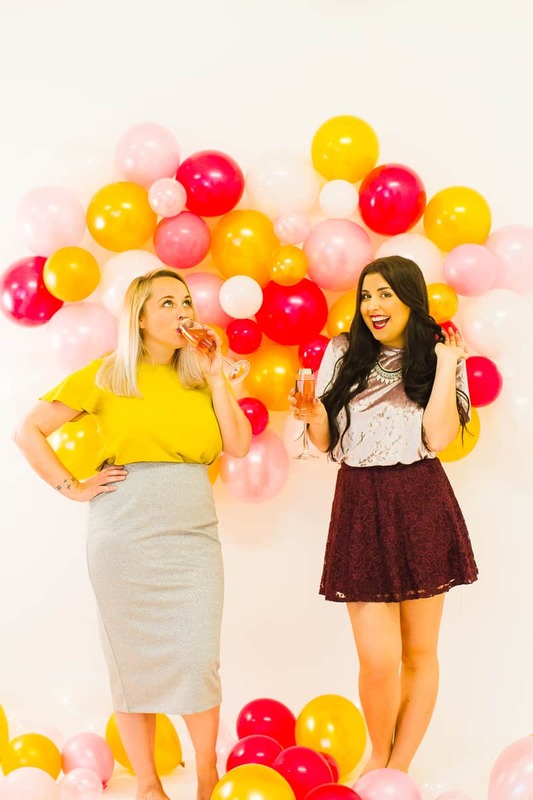 DIY BALLOON WALL BACKDROP FOR YOUR NYE PARTY! WOOHOO New year’s eve is almost upon us and it’s time to get into that party feeling! (unless you are already of course from all the Christmas festivities!) If you’re going to be throwing your own party this year then why not make a fun balloon backdrop for your guests to take photos in front of? It will be a great talking point and doesn’t just have to be for new year’s eve! How ace would this look at a wedding?! You could even match the balloons to your theme! Blow up all of your balloons using your pump so that you can see exactly what you have of each. We found it best to blow up the normal size balloons to full size and a medium size just so that we could fit them in the gaps easier and create a more interesting look with lots of different sizes. Start by taping a few of your biggest balloons to the wall, securing them in place on the ends of the balloons. Vary the colours as you build around each balloon. Keep going and filling in the gaps with your smallest balloons. We used sellotape to adhere these to the other balloons and keep them in place. Add more and more balloons until you’re happy with all of the placements and everything is nice and sturdy and in place! Push the rest of your balloons to the base of the display, all around the floor so that your guests can step amongst them! What a fun backdrop for a New Year’s Party! Definitely a theme and design worth capturing. All the photos and decorations look fantastic. Another great idea to add to the festivities and capture all the hilarious and special moments from the day is to add a photo booth!